In 1860 the Australian government offered a prize of £2000 to the first person to cross the continent from South to North. Two men contested the prize, John McDouall Stuart and Robert O'Hara Burke. Stuart reached the sea at the mouth of the Adelaide River near present day Darwin and returned to Adelaide. Burke left Melbourne on August 30, 1860 and reached the sea by February 11, 1861 at the Flinders River estuary. With five week's supplies and an eight week return trip, and reached Cooper's Creek on April 21 to find that the base part had left. Burke and his party tried to go on but they were too weak to continue. Only John King was still alive several months later when he was rescued. 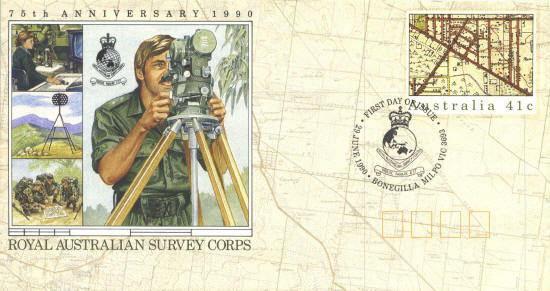 The cover was issued in 1990 to commemorate the 75th anniversary of the Royal Australian Survey Corps. The map on the envelope is of an area near Melbourne at approximately 38°S, 145°E. The stamp design shows an unidentified town plan.